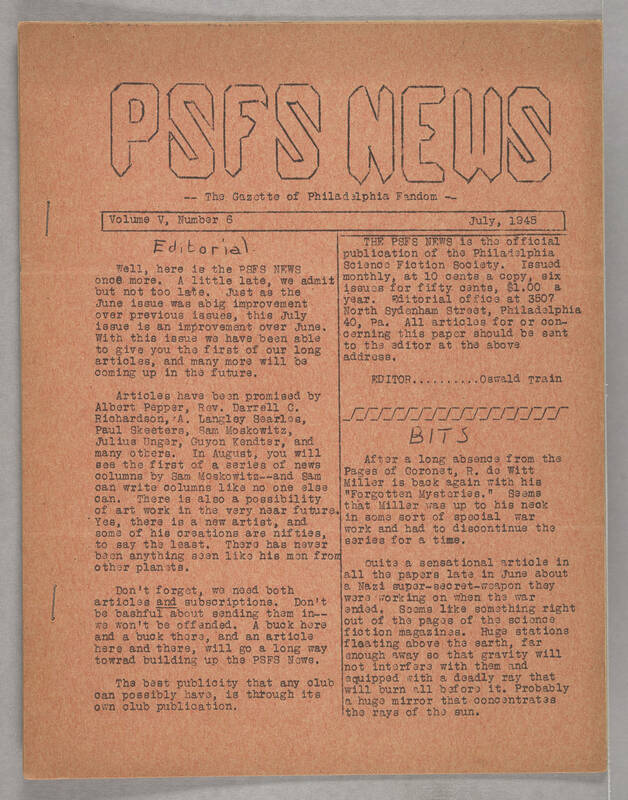 PSFS NEWS -- The Gazette of Philadelphia Fandom -- Volume V, Number 6 July, 1945 Editorial Well, here is the PSFS NEWS once more. A little late, we admit but not too late. Just as the June issue was abig improvement over previous issues, this July issue is an improvement over June. With this issue we have been able to give you the first of our long articles, and many more will be coming up in the future. Articles have been promised by Albert Pepper, Rev. Darrell C. Richardson, A. Langley Searles, Paul Skeeters, Sam Moskowitz, Julius Unger, Guyon Kendter, and many others. In August, you will see the first of a series of news columns by Sam Moskowitz -- and Sam can write columns like no one else can. There is also a possibility of art work in the very near future. Yes, there is a new artist, and some of his creations are nifties, to say the least. There has never been anything seen like his men from other planets. Don't forget, we need both articles and subscriptions. Don't be bashful about sending them in -- we won't be offended. A buck here and a buck there, and an article here and there, will go a long way towrad building up the PSFS News. The best publicity that any club can possibly have, is through its own club publication. The PSFS NEWS is the official publication of the Philadelphia Science Fiction Society. Issued monthly, at 10 cents a copy, six issues for fifty cents, $1.00 a year. Editorial office at 3507 North Sydenham Street, Philadelphia 40, Pa. All articles for or concerning this paper should be sent to the editor at the above address. EDITOR..........Oswald Train BITS After a long absence from the Pages of Coronet, R. de Witt Miller is back again with his "Forgotten Mysteries." Seems that Miller was up to his neck in some sort of special war work and had to discontinue the series for a time. Quite a sensational article in all the papers in late June about a Nazi super-secret-weapon they were working on when the war ended. Seems like something right out of the pages of the science fiction magazines. Huge stations fleating above the earth, far enough away so that gravity will not interfere with them and equipped with a deadly ray that will burn all before it. Probably a huge mirror that concentrates the rays of the sun.